A new series of progressively more powerful and more modern engines. The 110 was launched in 1983, and the 90 followed in 1984. From 1984, wind-up windows were fitted (Series models and very early 110s had sliding panels), and a 2.5-litre (153 cu in), 68 horsepower (51 kW) diesel engine was introduced. This was based on the earlier 2.3-litre (140 cu in) engine, but had a more modern fuel-injection system as well as increased capacity. A low compression version of the 3.5-litre (214 cu in) V8 Range Rover engine transformed performance. It was initially available in the 110 with a four-speed transmission with integral transfer case, then later in conjunction with a high strength "Santana" five-speed transmission. This period saw Land Rover market the utility Land Rover as a private recreational vehicle. While the basic pick-up, station wagon and van versions were still working vehicles, the County station wagons were sold as multi-purpose family vehicles, featuring improved interior trim and more comfortable seats. This change was reflected in Land Rover starting what had long been common practice in the car industry — detail changes and improvements to the County model from year to year in order to attract new buyers and to encourage existing owners to trade in for a new vehicle. These changes included different exterior styling graphics and color options, and the introduction of new options, such as radio-cassette players, styled wheels, headlamp wash and wipe systems, as well as accessories such as surfboard carriers and bike racks. The switch from leaf spring to coil spring suspension was a key part of the new model's success. It offered improved off-road ability, load capacity, handling, and ride comfort. The biggest change to the Land Rover came in late 1990, when it became the Land Rover Defender, instead of the Land Rover Ninety or One Ten. This was because in 1989 the company had introduced the Discovery model, requiring the original Land Rover to acquire a name. The Discovery also had a new turbodiesel engine. This was also loosely based on the existing 2.5-litre turbo unit, and was built on the same production line, but had a modern alloy cylinder head, improved turbocharging, intercooling and direct injection. It retained the block, crankshaft, main bearings, cambelt system, and other ancillaries as the Diesel Turbo. The breather system included an oil separator filter to remove oil from the air in the system, thus finally solving the Diesel Turbo's main weakness of re-breathing its own sump oil. 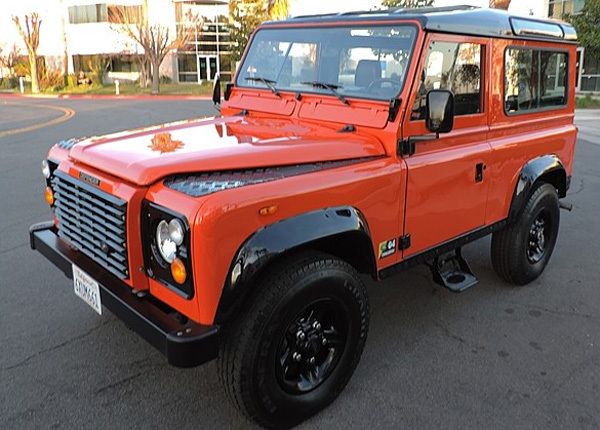 The 200Tdi, as the new engine was called, produced 107 hp (80 kW) and 195 lb·ft (264 N·m) of torque, which was nearly a 25% improvement on the engine it replaced (although as installed in the Defender the engine was de-tuned slightly from its original Discovery 111 hp (83 kW) specification due to changes associated with the turbo position and exhaust routing). Of note from an investor stand point these vehicles have basically doubled their value since they were sold new in the mid-1990's. They are no longer sold in the U.S. as new.